I thought my Roasted Butternut Squash Soup was great for a basic recipe, but after making it twice in two weeks, I wanted to try something a little different for week three. It's one of my favorite soups on earth and I've never tried one I didn't like so it's always fun to try a new variation. I'm a fan of Ina's Curried Butternut Squash Soup with coconut, banana, scallions and cashews as toppings (featured in her Back to Basics cookbook). 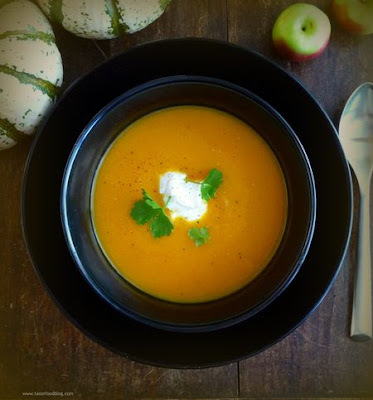 This time I was inspired by the recipe for Golden Squash Soup using curry and coconut milk as featured in the daily newsletter I get from The World's Healthiest Foods. Here's my version. It may be my favorite one yet. Heat oven to 400. Cut squash into quarters and place cut-side down on a nonstick baking sheet rubbed with a bit of olive oil. Pour about 1/4 cup water over the squash, and roast for 45 min-1 hour, until it's fork-tender. Allow to cool. Remove seeds and scoop out the flesh. In large stock pot, heat oil and cook onion over medium heat for about 5-8 minutes. Add shallots, ginger and garlic and saute for a few minutes making sure not to brown onions or garlic. Add herbs and stir, then add squash, apple and stock. Season with salt & pepper. Bring to a boil. Lower heat, cover and simmer for 20 minutes (or more). Stir in coconut milk. Then use a hand-held immersion blender or puree soup in a blender until smooth. Return to the pot and check seasoning. Stir in cilantro and serve.